As if chameleons weren't weird enough already, they go all Spinosaurus on us. Isn't it wonderful? Chameleons already push the boundaries of normalcy as far as they can, now they're pushing the boundaries of weirdness, too! At the same time... isn't it a little unfair? 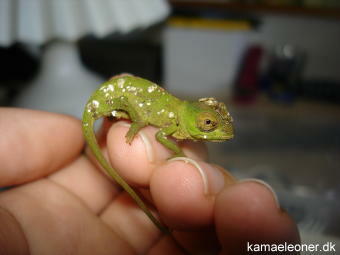 Chameleons have it all! Independent, bulging swivel-eyes. The kind of shooty-out, sticky tongue that frogs don't actually have. Conjoined-toe, branch-grasping feet. Prehensile, branch-whorling tail. Colour-changing skin. 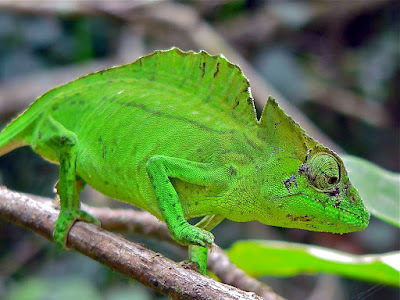 Chameleons are really just a grab bag of zoological eccentricities assembled into vaguely lizard-like form. I'm pretty sure they don't actually exist. Kind of like when people saw a giraffe and thought it was a leopard's body with deer legs and a snake's head. Chameleons are probably just monkeys wearing glasses and tiny Hawaiian shirts. 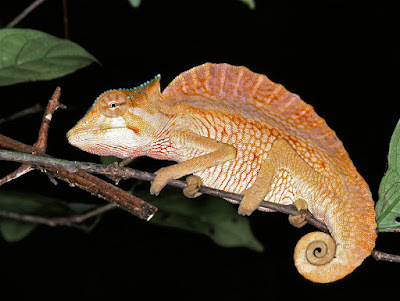 Where this idea of a "Crested" or "Sail Backed" Chameleon came from, who knows? These tall tales have a habit of growing in the telling. 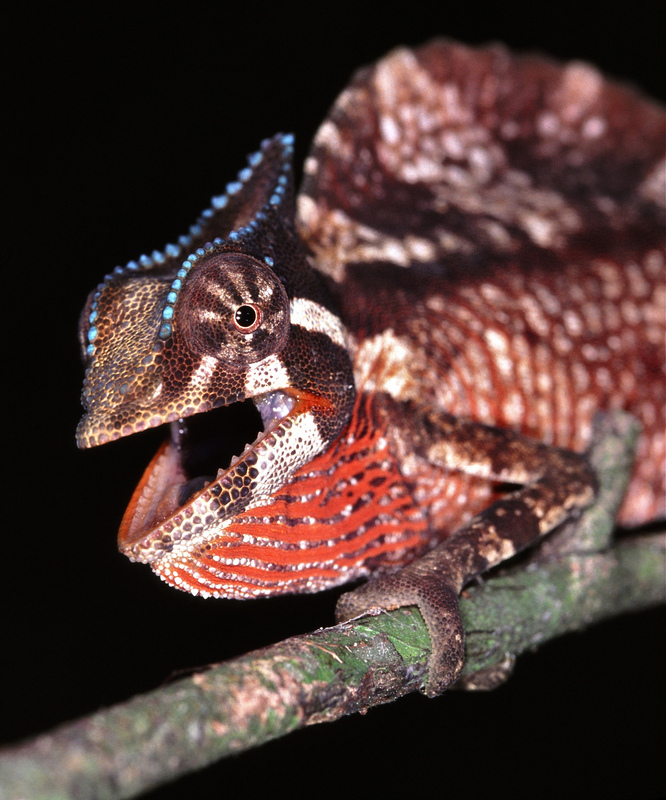 If we are to convince ourselves to believe the stories (and photographs and videos) of the legendary Crested Chameleon, then they inhabit the forests of central and west Africa. They reach a total length of almost 30 cm (a foot), with females slightly larger than males. However, males are armed (backed?) with a larger sail adorning their back. It can reach 3 cm (1.2 in) tall! 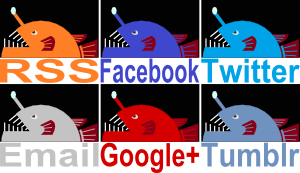 That's not the only difference between males and females, they also have different favourite colours. 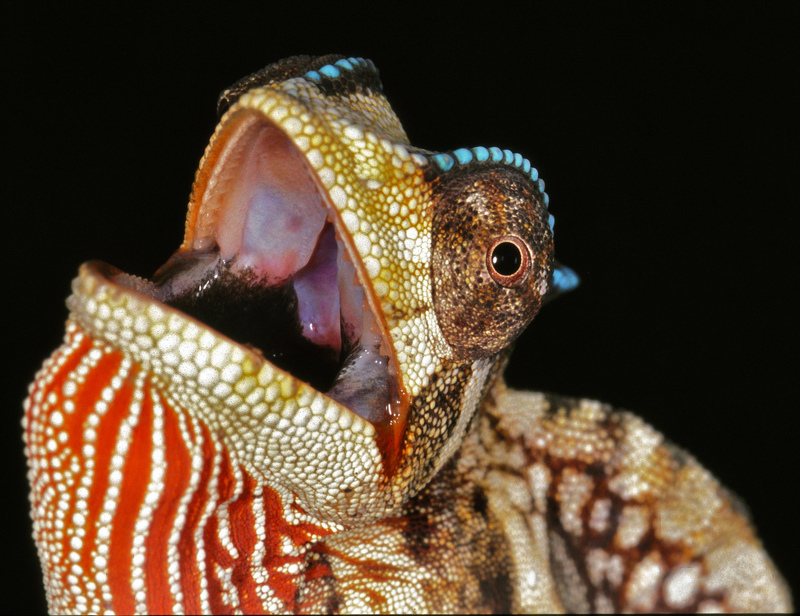 While they have lots of choice in that oh so chameleon way, females normally like to be green as they go about their day, while males prefer a more drab grey or brown. Crested Chameleons aren't one to climb high up into the canopy of forests. They like to remain closer to ground level, munching on insects during the day. At night they descend even closer to the ground and snooze in the bushes. The breeding season begins at the end of the rainy season. This is when males get a touch of the blues! Each male gains blue highlights over his eyes and all the way up the pointy crest at the back of his head. Now he has everything he needs for love and war. Aided by the power of blue highlights, he acquires a territory and defends it from rival males. Then he finds a lovely green lady to cuddle with his weird pincer feet. The green lady on the other hand can now lay about a dozen eggs which hatch some months later. Newly hatched females don't have a sail-back crest at all but males already have a tiny one. It makes you wonder what baby Spinosaurs looked like!